The love that two of you share is special and so is this magnificent arrangement. 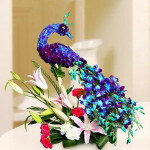 Orchids, oriental lily and carnation combined in purple peacock arrangement expresses the essence of romantic feelings. Let the right sentiment be expressed straight from your heart with this extravagant arrangement.